The CIA: Torture Is Our Trade. 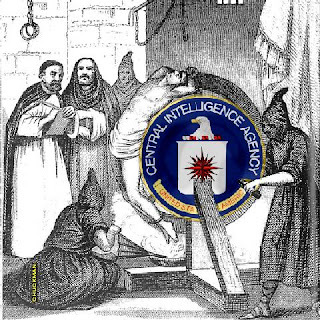 According to CIA inquisitors and their defenders in the press, no questions about CIA policies should be raised because the CIA is holy and pure, while its detractors are just a bunch of conspiracy theorists, left-wing radicals, and Islamofascists. As we can see, there are many similarities between the modern charges of terrorism and conspiracy theory made by intelligence agencies and the medieval charges of blasphemy and heresy made by religious authorities. The Catholic Church promised its flock salvation; the National Security State promises its flock security. Neither salvation or security can be delivered by political and religious authorities, but that fact hasn't stopped religion and government from going out of business yet.